Thanks to Dr. Rudy Rodriguez who reminds us that 2019 is the 50th anniversary of the original Federal ESEA Title VII legislation. Texas A & M University Professor Carlos Blanton cites the importance of bilingual education to European-origin groups in Texas, dispelling the myth that bilingual education was or is only for Latinas/os in Texas. Why is this legislation important??? This federal act provided the impetus for the implementation of the original federally funded 76 bilingual programs in the U.S. Fort Worth, Houston, San Antonio, El Paso were among the 17 original programs in Texas. It also led states such as Texas to repeal the English-only laws approved as early as 1918. Glad to see the late Senator Carlos Truán, the late Dr, George I. Sanchez, the late Senator Ralph Yarborough, Maria Seidner, Dr. Guadalupe San Miguel, José Ángel Gutierrez, Dr. Ángel Noé Gonzalez, Dr. Cuca Robledo Montecel, Dr. María Gonzalez Baker, among others, in the video, too. 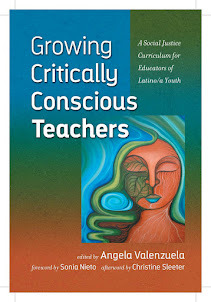 Crystal City also gets featured as a pivotal point in the bilingual education movement. The Intercultural Development Research Association (IDRA) is another important institutions that has been instrumental in leading the struggle for bilingual education. You will also hear expressed support for culturally relevant curriculum, too—which is what we term, Ethnic Studies today. Pride in one's heritage, as well as Spanish language maintenance is what the Mexican American community has desired forever and a day. Great video! Thanks to Rudy Rodriguez for this important reminder to our embattled history for bilingual education.